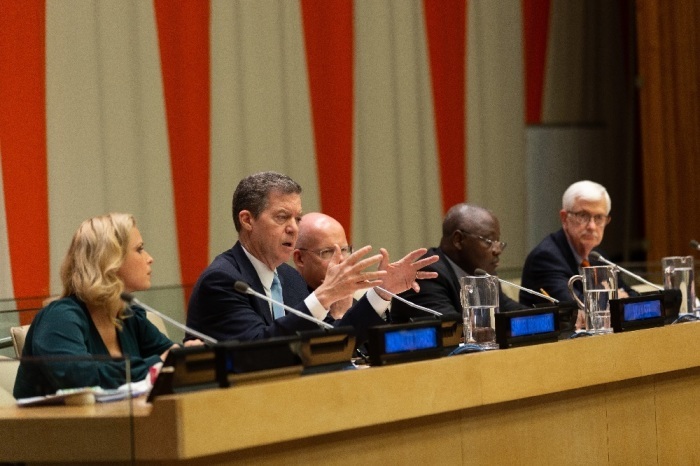 A desperately-needed global movement to push for religious freedom rights worldwide has begun, U.S. Ambassador-at-Large for Religious Freedom Sam Brownback said last Thursday at a United Nations event focused on religious freedom. Hosted by the U.N. NGO Committee on Freedom of Religion or Belief, an event titled International Religious Freedom: A New Era for Advocacy in Response to a New Age of Challenges and Threats was held at the U.N. headquarters in New York City last week. Along with Brownback, respected religious freedom advocates from around the world were invited to speak about religious freedom issues impacting their communities. The event was kicked off by moderator Monsignor Tomasz Grysa, the deputy permanent observer of the Holy See to the U.N. He laid out the troubling landscape for religious freedom worldwide and said there has been a steady rise in persecution and discrimination against Christians, Muslims, Jews and other religious followers across the globe. Brownback, a former U.S. senator and governor of Kansas, followed Grysa by asking specifically why there continues to be an increase in religious persecution worldwide when most countries in the world have agreed to the U.N. Universal Declaration of Human Rights that is supposed to protect an individual’s right to religious freedom. Brownback challenged those in attendance to create some kind of body that will incentivize countries to respect the religious freedom rights of its citizens. As noted by Grysa, a 2018 U.N. report found that there are 24 nations with official state religions that impose “very high” or “high” levels of restrictions on religious practices while another 11 countries with “favored religions” have similar religious restrictions. “This is something that needs to take place out of this body and out of people that are here to push for religious freedom,” Brownback contended. Brownback stressed that there are “dire situations” facing many religious minority communities in countries that have agreed to the Universal Declaration of Human Rights. Such examples are the 1 million Uighurs imprisoned in China and the nearly 1 million Rohingyas pushed out of their homelands by security forces in Myanmar in an apparent genocide. Brownback also mentioned injustices facing religious minorities in Iran and the genocide perpetrated against Christians and Yazidis in Iraq by the Islamic State. Brownback then detailed the movement that is already taking shape across the globe to push for more religious freedom. In addition to the U.S. State Department hosting its second-annual Ministerial to Advance Religious Freedom on July 16-18, Brownback said that a series of regional religious freedom summits kicked off in February. The first one was held in Abu Dhabi, the capital of the United Arab Emirates, last month. Brownback said that another regional religious freedom summit will take place on March 10-12 in Taiwan. That gathering will focus on bringing together civil society groups in order to talk about what they can do to advocate for religious freedom in their countries. The ambassador added that there will likely be a future regional summit in the African nation of Morocco that will focus on the importance of preserving religious heritage sites. Brownback warned that such sites are being destroyed because of their faith orientations. The East Asian nation of Mongolia also plans to host a regional summit primarily of Buddhist majority countries, while another regional summit will likely be held in Europe. Brownback said that the U.S. is working with six different countries that are launching their own religious freedom roundtables similar to the one hosted by the U.S. government every week. In Washington, D.C., religious freedom advocates gather every Tuesday from 11 a.m. to 12 p.m. to discuss religious freedom topics with Brownback on Capitol Hill. Countries looking to launch their own roundtable are Iraq, South Korea, Taiwan, Hungary and Kazakhstan. According to Brownback, those roundtables will hopefully spark advocacy groups in those countries to advocate for religious freedom. Additionally, a group of parliamentarians who support religious freedom has launched the informal cross-party group All Party Parliamentary Group on International Freedom of Religion or Belief to push for religious freedom worldwide. Thomas Farr, president of the Washington-based think tank Religious Freedom Institute who also served as the first director of the U.S. State Department's Office of International Religious Freedom, said during the event that there were “very few civil society organizations fighting for international religious freedom” when he first began his career in religious freedom advocacy. Grysa explained that because of the rise of religious intolerance and oppression in the world, "the protection of the right to religious freedom must be one of the most urgent responsibilities of the international community."